How do you become an effective and successful doctor? It is more than just being a good physician. A lot of it has to do with your mindset. Below are the seven habits successful doctors follow. Develop the mindset of success. Failure is not an option. No matter what life hands you, you need to plow through it and develop a “no excuse” attitude. Get rid of the “poor me” attitude. No one wants to hang out with negative and depressed people. Stay positive all of the time. Find a good book you can rely on to lift you up. Stop watching negative TV. Find a mentor. You cannot do everything yourself. You need to surround yourself with smart, and successful people. Trust me, if you have a problem, it’s guaranteed another person has had the same issue. This person can help you get out of your situation. Find a group of like-minded people that you can meet monthly and share ideas. This is called a mastermind. Have successful and efficient weekly staff meetings that are regularly-scheduled. Use these meetings to praise the staff as well as to go over areas that need improvement. In addition, ask your staff their opinions on certain aspects of the practice. You should also have separate meetings with your manager and your doctors. The key to all of the meetings is to make sure every staff member is on task in order to achieve their specific goal as well as the practice’s goal. Rely on systems. Have written systems and protocols which are used for training and to keep the office running smoothly. Set goals. Yes, you need to know where you want to go, otherwise you won’t have a reason to get up in the morning. Perform a SWOT analysis of your practice. That is your strengths, weaknesses, opportunities, and threats. Make a complete list, strengthen your strengths, and turn your weaknesses into strengths, too. Sharpen your saw. Slow down to speed up. Take care of your body and your mind. Take time off to rejuvenate. Schedule a spa day if you are stressed and shut off your phone. Read good books. Workout and drink plenty of water. It’s time to get rid of all the negative press about how bad being a doctor is today! 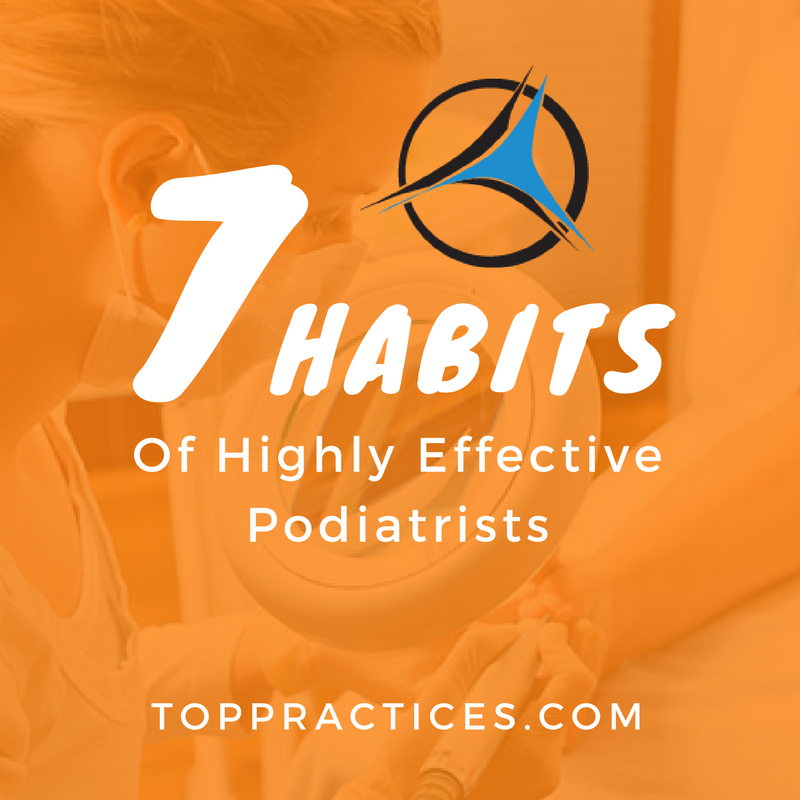 Podiatry is a great profession and you can make a great living doing what you love to do, especially when you follow these seven habits.